Learn what you need to become a practicing clinical herbalist. For students who have completed the Foundations program, or who already have significant foundational experience and understanding of herbs and herbal medicine, we offer advanced classes covering all elements of professional clinical herbalism. For students who would like to transfer into the Advanced Studies Program from other schools, there is a pre-requisite exam - please contact us! After completing the Advanced Studies Program and Clinical Rotations, you will be capable and comfortable working with clients as a clinical herbalist in your own private practice or as a member of a holistic health partnership. Students have also gone on to create herbal products companies, to teach, farm, run herbal conferences, and other herbal-related pursuits. I just wanted to remind you of how grateful I am for the work you do. In addition to teaching about herbs, you create a forum where people who are different from each other can find common interests and common grounds, and learn about each other in a loving, welcoming space. This program includes a number of learning modalities, both in our class time together and in assigned homework, projects, and exercises. We spend a fair amount of class time in lecture and discussion, explaining the concepts and strategies we use to work with herbs and people. This course focuses on advanced pathology (insulin resistance, Lyme disease, cancer, etc), materia medica, and clinical skills. We devote major class time to clinical nutrition, sleep therapy, and stress management - cornerstones of vitalist healing practice. We will also start to incorporate new modalities into your training, including appropriate movement habits, structural alignment, lifestyle amendment, and more! And we work more deeply into formulation, with specific emphasis on formulating herbal preparations appropriate to your client's constitution. Students in this program observe client sessions conducted by faculty, to see how the principles of herbalism are applied in practice. They then report their impressions and questions at the next class meeting, and we set aside time for detailed discussion of these case studies each month. This program's homework requirements include a number of monthly projects. We continue with our Herb of the Month practice, focusing now on lesser-known herbs or more advanced uses. Students commit to month-long personal lifestyle interventions, including diet changes, sleep prioritization, and daily meditation practice, in the interest of developing personal fluency in these skills so they can be more effectively imparted to future clients. There are also more extensive research projects in this program - for example, after our discussion of clinical nutrition, students write up detailed diet plans for a number of theoretical client cases, including low-income situations. Finally, there are skill-building exercises to develop aptitudes for assessment, case analysis, and formulation. A thorough understanding of Anatomy and Physiology is required at this level. If you have not already completed a college level A&P course, you can enroll in Tammi Sweet's Anatomy and Physiology for Herbalists course, which takes place each year in January and February. There is special pricing for our Advanced Program students. Clinical herbalists are teachers, first and foremost. There will be opportunities for each student to practice teaching skills with their peers, including leading herb walks, explaining key health concepts, and presenting on various herbal topics. Our online forum is a major component of the program. There, we post each month's homework readings, project assignments, and class recordings. We expect all students to submit homework, ask questions, and participate in discussions of our readings and projects on the forum. All sessions are recorded and these class recordings are made available in our forum as soon as possible after each session, so that they can be reviewed again at leisure during the time between classes. This also allows students to catch up on any classes they miss during the program. Based on our experience with past years' students, we find that it's best if students listen to the recordings of our classes each month, even if they were present at the live sessions - we talk fast and cover a lot of material, and it helps to have the reinforcement. We recommend a number of books to our students, and while none are required, reading them does expand upon and deepen the material from our class sessions. It's important to make sure that you have the time in your schedule to commit to weekly study, including completing homework assignments, readings, research projects, and so on. We estimate this should amount to 7-10 hours each week, separate from the in-class time we spend together. 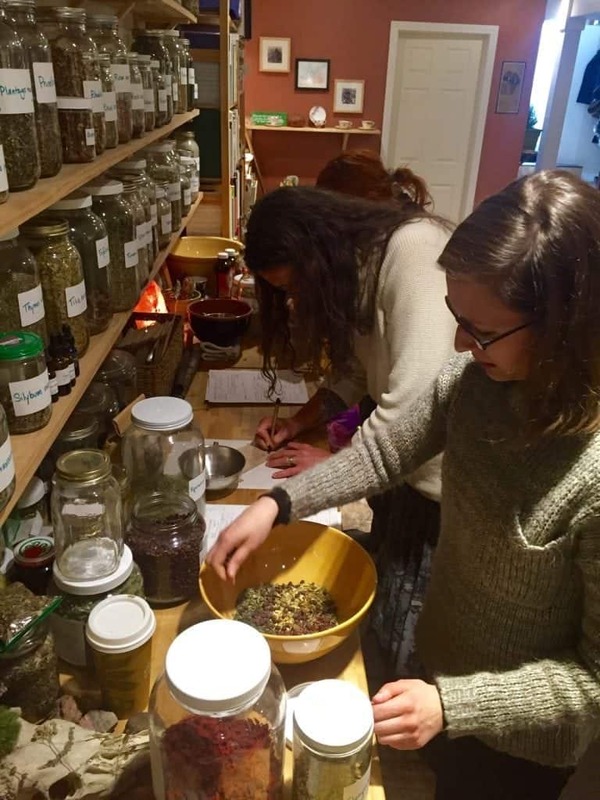 The average of the hourly tuition rates at a dozen rural and sub-urban herbalism schools in the Northeast is approximately $15/hour; in urban areas, the average is $19/hour. In an effort to make our program affordable to as many people as possible, we offer our course at the lower rate, so the tuition for this 200-hour program comes to $3000 total. Enrollment in the program constitutes a commitment to pay the entire tuition. A non-refundable deposit of $300 is required to complete enrollment and reserve your space in the program. We expect to reach our maximum capacity for students again this year, so it is wise to submit your deposit as soon as you are notified that your application has been accepted. The remainder of the tuition may be paid all at once by cash or check, or in monthly installments. If you prefer to pay in installments, you can sign up for an automated recurring debit via PayPal. (This will require you to have or create a PayPal account, but you will then be able to use any credit card or bank account to pay.) There is a $10/month administrative cost for this option. Either the full tuition payment must be made, or the PayPal subscription must be completed, within 14 days of our first class session. We extend an elder's discount of 20% to anyone over the age of 60. A 20% discount is also available to veterans and active service members. We support Native American tribal members, local farmers, and street medics with discounts and scholarships when possible - contact us for more information. There are no required books for the program, but several are strongly recommended. A budget of $50-$100 should more than cover the costs for a few basic books, and many of the books we recommend are available in the Boston Public Library system. All of our assigned readings are in the form of articles, studies, monographs, and other resources which are accessible online for free. Students will also be expected to acquire their own herbs and other medicine-making ingredients and tools for materia medica study and practice: tea strainers, oils, beeswax, alcohol for tinctures, bottles, etc. We provide information about local herb shops and suppliers. We estimate total incidental expenses should amount to no more than $25-75 per month. We expect those who enroll in this program to be serious students who are committed to completing the whole course. For this reason, we offer a two-week window at the beginning of the session when you can withdraw from the program if it doesn't seem to be a good educational match for you. After that point, we do not offer tuition refunds. The $300 deposit is non-refundable. This deposit is deducted from the total tuition once the course begins. A refund of the remainder of the tuition will be given to a student who withdraws in writing within 14 days of the first day of class. This year's drop date is January 25th, 2019. All students who are enrolled in the Advanced Studies Program receive a discount on all community classes we offer, and are invited to all of our public herb walks free of charge! The Advanced Studies Program meets one long weekend a month, January - October: classes take place 10:00am - 5:00pm on Friday, Saturday, and Sunday each weekend we meet, and are held at our school/clinic space: 25 Saint Mary's Court, Brookline MA 02446. Clinical observation time is scheduled separately. Each student is expected to observe a minimum of four client sessions over the course of the program. These observation sessions are generally scheduled for evenings and weekends. Students will need to be flexible about planning for these sessions around work and other commitments they may have. One of our weekends is a camping trip, which will include hiking and sleeping in tents. Students will be given the details of this excursion upon enrollment. Advanced classes are open to all graduates of our Foundations Program. For students who are hoping to transfer in after completing a program at another school, we have an assessment exam. This covers the broad strokes of what’s learned in our first year program, and we ask anyone looking to come from another school (or from prior self-study) to complete it before we accept them into the Advanced Program, because herbal schools and teachers differ substantially in what their programs include. If you’d like to take a look at it, just contact us! You can find out about some of our successful graduates on our Students and Graduates page. If you have a question that wasn't answered on this page, check the FAQ!